Pushing across eastwards from the residential areas of Avondale Heights, I came to a small reserve, Canning Reserve, which leads to Steele Creek Reserve, revegetated with native species by the local friends of the creek. I walked through it on a hot day in November, with few other people around. 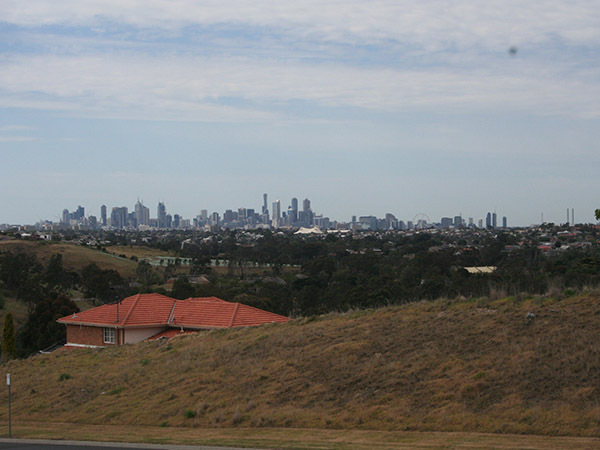 At one point the reserve is quite elevated, and you have a good view across the Maribyrnong river to an area of abandoned, fenced off land, dotted with deserted brick buildings. To the east there’s a view of the city, some 10km distant. Nothing’s going on in the fenced off area, which is bordered by the Maribyrnong (formerly known as the Saltwater) to the north, east and west, and Cordite Street to the south. That area of fenced-off land has been owned by the Department of Defence since 1908. Prior to that, it was known for horses – the Maribyrnong racecourse was there, and Fisher’s famous racing stables. Before that, for thousands of years it was the Wurrung country of the Woi Wurrung people. But within more recent memory it’s known as the location of an explosives factory. 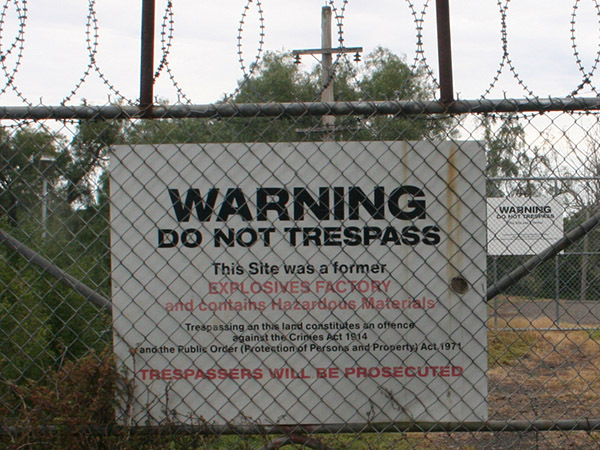 This was one of the most significant munitions sites in the western suburbs. The explosives factory was built in 1908 and was particularly active during World War Two, when thousands of people worked here, manufacturing cordite, nitroglycerine and TNT, which went into shells, bombs, grenades, mines, depth charges and cartridges. This explains the name of Cordite Street which runs along the south border of the site. A few other street names nearby hint at the history of the area: Sentry Place, Ordnance Reserve, and Military Road, the main artery up through Avondale Heights. During World War Two, this site employed more than 6,000 people, mostly from the western suburbs. In all, according to John Lack’s A History of Footscray, munitions and ordnance factories employed 22,000 people in the region. Shells, mines and bullets were proudly ‘made in Maribyrnong’. 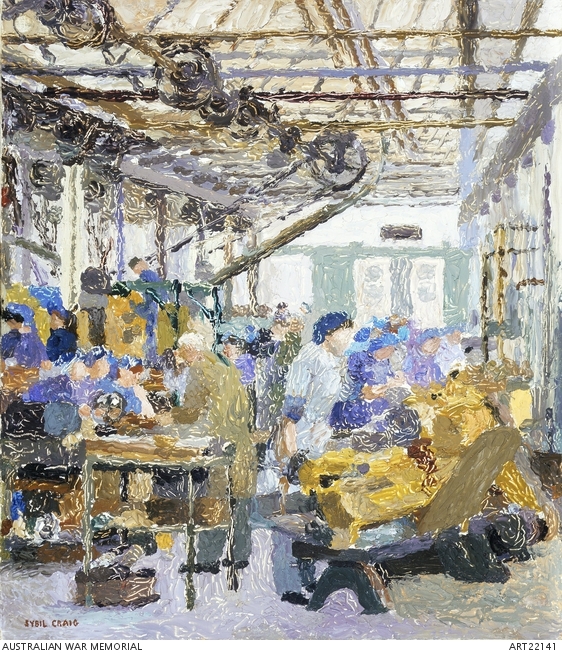 The factory was only of the largest employers of women during the war, though the pay rate was only 90 per cent of the male rate, and after the war many were replaced by returned servicemen. Many of the workers would never have worked in an explosives factory before. It would be quite something for your first work experience to be as a bomb maker. Explosives factories are hazardous places. The workers had to handle substances such as sulphuric acid and nitric acid, from cold to boiling point. There were many cases of workers being gassed by sulphur dioxide. Contact with nitroglycerine caused violent headaches and dermatitis. Machines created a toxic dust which settled on the faces and skin. TNT is easily absorbed by the human body causing serious, sometimes fatal liver damage. God only knows what health problems the workers suffered later in life. I wonder if any studies have been done? There must have been in the back of everyone’s mind the thought that, at any moment, a fatal accident could lead to the whole place exploding. In Britain, during the First World War, there were at least three major explosions at munitions factories, killing hundreds of workers. And such a facility was obviously a potential enemy target. Not much to smile about you might think, as you went to work every day in the Pyrotechnics Annexe. And yet there would also have been a sense of camaraderie and pride among those working there. 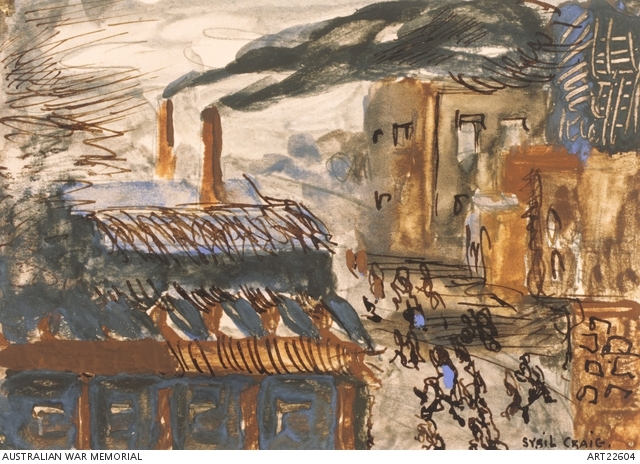 The Melbourne artist Sybil Craig, appointed an official war artist in 1945, spent several months at the site and painted the women working there. You can see her paintings at the Australian War Memorial site. Here’s a couple of them, which to me convey a strong sense of the place and its atmosphere. ‘I decided to go to the Footscray ammunition factory. I worked at Myers for four years as a salesgirl, and one thing that attracted me was the money. I was receiving 26 shillings a week at Myers, working from 9 to 6, four days a week, 9 to 9 on Friday, and 9 to 1 on Saturday, and when I went to the ammunition factory my salary was 2 pounds, 1s, 6d which was marvellous. After the war the factory went on providing rocket and missile components for the Australian services until 1994. The site was also used by CSIRO and Defence laboratories for research. The factory closed in 1994 and since the mid-2000s the site has largely been vacant. Such a prime piece of real estate – with at least 3 km of river frontage – has huge value, and is regarded as ripe for development. The obvious problem is that it is highly contaminated. However, after various investigations and assessments and Master Plans and Shared Visions and the Preparation of a Remediation Action Plan, it is going to be redeveloped into a substantial residential area. I walked around the site, heading east along Buckley Street, then turning down Afton St into a pocket handkerchief of a suburb called Aberfeldie. On the eastern edge of the site, new houses have been built right beside the fence. From here you can get a closer view of the abandoned Defence buildings. It’s a strange feeling to stand in the stillness and imagine the site bustling with thousands of women and men. The peace and quiet is a far cry from what it was then, a place of racket and stink. But traces of the past live on in the land itself, which is contaminated by nitric and sulphuric acids, and god knows what else. The idea that it can all be cleaned up in a fairly short period of time seems optimistic. The Maribyrnong Council website states “It is anticipated that the State Government, VicUrban, Maribyrnong City Council and the community will work collectively to ensure an appropriate outcome for the site.” I’m not sure what that means, or in what way 3000 dwellings could be regarded as ‘appropriate’. Melbourne Circle waits with interest to see what street names appear on the new estate in homage to its history. Sulphuric Way? Nitric Lane? Explosive Avenue? Or perhaps they’ll ignore all that and hearken back to the more peaceful days of equine occupation. Racecourse Way might be a more attractive address. The site’s importance is well known – it’s listed on the Victorian Heritage Database as having ‘national historical, architectural, social and technical significance’. At least some of the site should be preserved. What about a museum to acknowledge the importance of the explosives factory and remember the thousands of people who worked there? You can read in much more detail about the explosives factories of Maribyrnong and elsewhere in David Mellor (1958), “Chapter 16: Ammunition and Explosives”, Australia in the War of 1939–1945, Series 4 – Civil, Volume 5: The Role of Science and Industry, Australian War Memorial, p. 358. John Lack’s A History of Footscray (1991) includes much interesting material about Footscray at war. The Living Museum of the West has a collection of material about the munitions factories. I’m interested in hearing from anyone with personal or family memories of the factory. Sounds like this part of the Melbourne Circle was livelier than Apocalypse Heights. Yes, Racecourse Way, and Furlong Avenue and Home Straight and Jockey Court and Saddle Street could be possible street names. And, of course, references to Wurrung country and the Woi Wurrung people. Thanks Vin – yes a very interesting spot – all of its layers of history need to be respected and remembered somehow. That would be great, thanks for the message Rod. Am away at the moment and will be in touch in a couple of weeks when back in Melbourne. Glad you like the story. I have a measuring device, manufacturer W. Wilson – Reid . Explosives factory melbourne?